I remember straying from my path and finding a frog on the side of the road. As a secret agent trying to get into the Soviet Consulate, I didn’t have time to idle around, but this frog needed my help. Normally, these kinds of things could be overlooked, but any animal standing on the curb with a pink mohawk amid a mass of black, faceless figures is going to get some attention. Not knowing what to do, I talked to the frog, who wanted me to help him get into some WiFi. In order to this, I needed to help him get to the other side of the street, pick up his device, and bring him back. And then a game of Frogger happened. A terrible round of Frogger, mind you, where I caused the frog to get hit several times, but an ultimately successful one where the frog thanked me and I moved on. There wasn’t any extra prize for helping him; the prize was presented as the joy you got for magically finding a sentient frog that let you play a classic game with him. 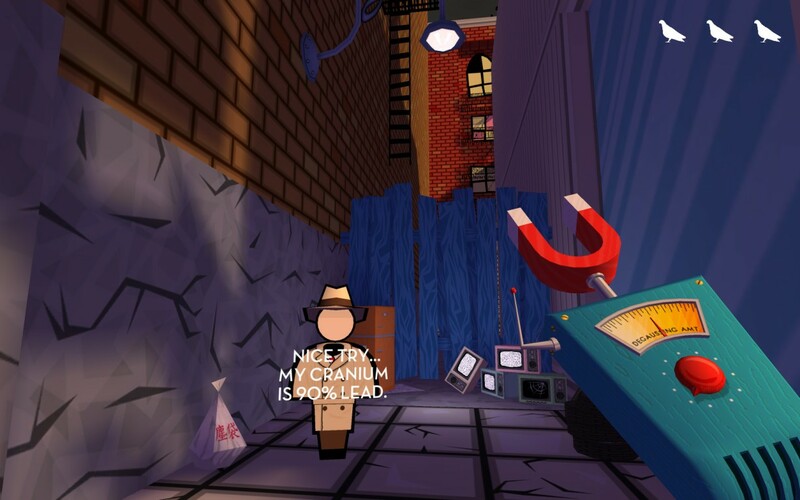 The side games that appear seemingly at random in the Jazzpunk universe are interesting: They become the comedy title’s main focus, causing the player to stray from the path on purpose and creating an arcade that exists inside of a game that’s ostensibly about secret agents. The side games can happen anywhere, but provide absolutely no reward for completion. The player doesn’t gain any experience, or receive any special items. These kinds of things act as a nice reprieve, giving the player something recognizable amidst the chaos and confusion of Jazzpunk’s “story.” If the focus of the game becomes discovering the mini games and inside jokes, then could you really say that Jazzpunk has a story?